Young innovators of the future have been given an insight into the world of business through a visit to Mid Wales-based Invertek Drives Ltd and neighbouring companies. Pupils from Llanfair Caereinion Primary School visited the headquarters and global manufacturing centre of Invertek at the Offa’s Dyke Business Park at Welshpool, Powys, as part of an enterprise day organised by Cambrian Training Ltd. 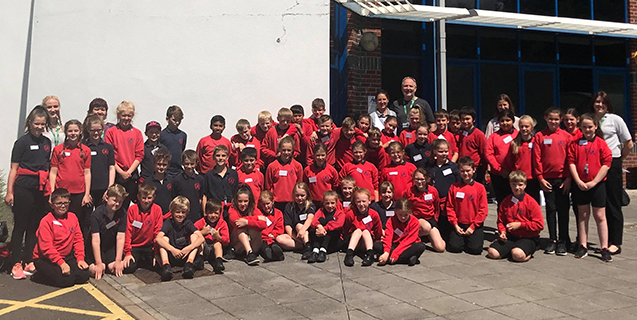 The children visited other companies in the business park, including Dynacast, Kingswood Framing, Zip-Clip and Cambrian Training’s headquarters. The pupils toured the offices and production centre at Invertek, meeting teams from innovation, technical, sales, marketing, finance and HR departments, as well as directors. Morris, engagement officer at Cambrian Training Ltd.